1. The peach was originally a heavenly fruit of immortality from the garden of the Goddess of the West (Hsi Wang Mu) and is the main ingredient for making pills of longevity to grant good health, long lives and immortality. This auspicious fruit resembles a long healthy life with great fortune for many generations. 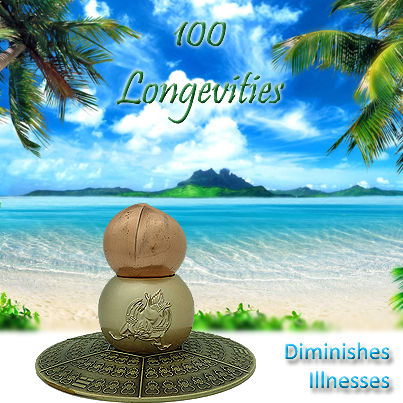 It is suitable as auspicious gifts for birthdays and for elderly people. 2. Known as the mythical lord of the birds. the great powered Garuda defeat demon spirits that bring illnesses, setbacks and obstacles to success. Therefore, Garuda is an esteemed destroyer of illness energies. Feeding on powerful serpents and nagas, no naga is able to survive Garuda's grip or bite. Garuda's triple sadhana (practice of three deities) is highly effective for removing obstacles or illnesses, especially naga-related afflictions such as kidney failure, plague and cancer. Therefore, Garuda is a revered cure for contagious diseases and deadly illnesses. 3. The God of Longevity is a powerful emblem of longevity. He is usually portrayed carrying the peach of immortality in his hands. Together with the auspicious deer and crane, the Star of Longevity is a powerful cosmic symbol of good health and a life that extends till the ripe age. 4. Based on the I Ching, the "DUI trigram" yields the Heavenly Doctor (Tien Yi) that holds the key to remedying Illness Star #2. Only limited few powerful masters who know the secret of this (especially those from the classical school) would incorporate the DUI Trigram straightforwardly to remedy the Illness Star authentically. 5. The 8 Immortal Implements in the center pool catalyses the powers of the taoist 8 Immortals to help bless one with positive energy, bring good health, good fortune, wealth, fame luck, longevity and good descendants. 6. 100 "Sau" (Longevity) symbols hidden underneath the base is a powerful connotation that magnifies longevity, creates excellent health and ensures that a long life is uninterupted by sudden unfortunate death. 1. Long Mantra of Medicine Buddha - the Medicine Buddha has unbiased compassion for all. He protects everyone from physical and mental sickness and other dangers and obstacles, and helps them to eradicate the three poisons – attachment, hatred, and ignorance – which are the source of all illness and danger. The Medicine Buddha not only helps in healing but also for overcoming the inner sickness of attachment, hatred, and ignorance. Thus the Medicine Buddha can help decrease physical and mental illness and suffering. The Medicine Buddha mantra is held to be extremely powerful for healing of physical illnesses and purification of negative karma. Anyone who is stricken by disease can seek blessings from the Medicine Buddha for curing. 2. Exalted Mantra King of Great Breath Mantra - it is believed that diseases are caused by the breath sent out by the great lord of all the spirits of all the three continents called Grinning Teeth (sekpa). All humans and spirits living in the world may contract various sicknesses and having their lives taken away once the destructive breath fills up the whole world and touches sentient beings. And it was revealed that the anecdote to the diseases is through the practising of this mantra called the "Exalted Mantra King of Great Breath". Whenever it is practised, sentiant beings will not be harmed by the breath. The mantra when worn or kept on ones neck, head or body will be protected against Ebola Virus and other contagious diseases, receiving no harm or sicknesses (tongney) from wind, bile, phlegm etc. 3. Heart Sutra Siddam - it benefits you by clearing 84,000 obscurations, brighten up the path and generate happiness. It clears out unclear, abstruse, indistinct, vague, indefinite, inconspicuous, hidden, remote, gloomy, dark, clouded or dim vision. It leads you to a positive path of transformation. 4. Four Dharmakaya Relic Mantras - are essential mantras that give power and make the object holy. According to Eight Trigrams philosophy, the illness star#2 is represented by the "kun trigram". And we know that changing the first and second lines of a trigram yields the Heavenly Doctor (Tien Yi). And, changing the first and second lines of "kun trigram" actually yields the "dui trigram". Therefore, the DUI is the trigram that remedies Illness Star #2. The Wulou (bottle gourd) originates from a fruit. When dried, it is very durable and its shape render it useful as a receptacle for medicine. In olden days, the Wulou was often carried by aged people as a charm of longevity and a charm to dissipate or ward off pernicious influences. The Wulou, like baguas and windchimes, is one of the most significant tools to cure many bad situations and to enhance good luck in Feng Shui. It is a powerful symbol of health and longevity. Many deities like the Sau Sing Kung (in 3 Lucky Stars Fuk Luk Sau), Li Tieh Kuai (in 8 Immortals) and Mad Monk God (Chai Kung) carry the Wulou with them to resemble their ability to cure difficult ailments. Some said the shape of the Wulou is also a wonderful integration of heaven, earth and mankind. Feng Shui masters often regard the Wulou as the replica of the Dui Trigram which signifies heavenly doctor. In real life, taoist monks also use the Wulou to absorb and arrest bad evil spirits into it for imprisonment. Therefore Wulou has the potency to absorb bad chi and negative energy. 1. Display it in the bedroom to create protective shielding of aura against illnesses, to heal ailments/sickness and to rejuvanate the energy of sick people. 2. Display it in the sector afflicted by mountain star#2 or water star#2 according to the natal flying star chart of your house. 3. Display it in the east sector of your living room, family room and dining for the benefit of the entire family. 4. Display it at your workdesk to eliminate illness chi from harming you. 5. Display it as a powerful cure on annual Illness Star-2. Eg. in 2016, it is in the center.